The R-PLEX Insulin Antibody Set includes a matched capture and detection antibody pair and calibrator for the quick and easy measurement of Insulin in biological samples. R-PLEX products leverage MSD’s electrochemiluminescence technology for better sensitivity and a larger dynamic range than traditional ELISAs. R-PLEX matched antibody sets enable the development of singleplex and multiplex immunoassays. Individual assays may be developed using MSD avidin- or streptavidin-coated plates. Custom multiplex assays with any combination of R-PLEX analytes, as well as R-PLEX and U-PLEX analytes, can be developed on U-PLEX MULTI-SPOT plates. To learn more about the advantages of R-PLEX products click here. 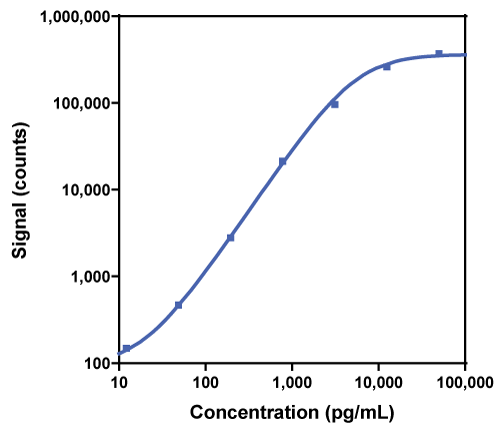 Calibration curve for the R-PLEX Insulin Antibody Set was assessed and representative data is presented below. Description - Insulin is a peptide hormone that is produced in the pancreas by β cells. Insulin is involved in the regulation of carbohydrate, fat, and protein metabolism. Low levels of insulin cause liver cells to convert glycogen to glucose and secrete it into the blood. Type 1 diabetes results when the β cells no longer produce insulin resulting in high glucose levels. Individuals with type 1 diabetes depend on exogenous insulin for their survival because of an absolute deficiency of the hormone. Glycemic, insulinemic, and appetite responses of patients with type 2 diabetes to commonly consumed breads.